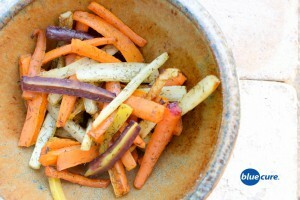 These perfectly roasted dill carrots are a tasty side dish for nearly any meal! Serve them warm or cold, toss them onto salads, or enjoy them on their own as a tasty afternoon snack. If you aren’t a big fan of dill, no worries! Coat the carrots and any dried herbs you like– or just roast them with a dash of oil. Carrots will become sweet as they are allowed to cook— you may even start to believe they taste a bit like candy! Preheat oven to 400 F. Wash and cut the carrots. Lay the carrots on a pan or baking dish. Pour the olive oil and dill over the carrots and coat evenly. Place the pan in the oven and cook for 30-40 minutes ( or until desired texture). Be sure to stir often.